The letter was signed on 2 February but publicly released on Tuesday. According to the BBC's Rupert Wingfield Hayes, in Beijing, this open outburst against China's media censors is all the more surprising because of who it comes from. Those signing the letter include Chairman Mao's former secretary, Li Rui; the former editor of the Communist party's own mouthpiece, People's Daily, Hu Jiwei; and ex-propaganda boss, Zhu Houze. Freezing Point, a supplement of The China Youth Daily, had incurred the wrath of the government on several occasions over the last few months, its editor, Li Datong, told the BBC's Chinese Service in January. He said that the excuse the authorities gave for shutting down the supplement was the publication of an article on 11 January by Yuan Weishi, a professor at Zhongshan University, on the way history is taught in China. Mr Yuan wrote that Chinese text books never acknowledge the culpability of the government, but blame others instead. "We were raised on wolf's milk," he wrote in the article, meaning a culture of hatred and violence. Paris-based organisation Reporters Without Borders has frequently criticised restrictions on the media in China, and says Chinese journalists are routinely forbidden from mentioning many sensitive subjects. 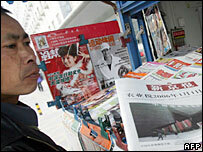 In its 2005 world press freedom index, China came 159th out of the 167 countries listed.